Emirates Skywards is rolling out a new limited time offer for all new and existing Skywards members to boost their Miles. The offer is valid for Economy and Business class tickets booked on Emirates and flydubai between 20 March 2019 and 31 March 2019 for travel between 10 April 2019 and 27 June 2019 and between 6 September 2019 and 30 November 2019. Members will earn 100% bonus Skywards Miles on top of their regular Miles for their first ticket during the eligible travel period. If flying more than once with Emirates or flydubai during the offer period, members will earn a 200% bonus Skywards Miles for their second ticket and 300% bonus Skywards Miles for their third ticket. The Skywards Miles earned through the offer can be redeemed for flights and upgrades on Emirates or flydubai. Members will need to register online to be eligible for the offer and will have to choose Saver, Flex or Flex Plus fares on Emirates flights and Value, Flex or Business fares on flydubai flights. Emirates Skywards members can access the latest information on special offers through the Skywards section on the Emirates app. 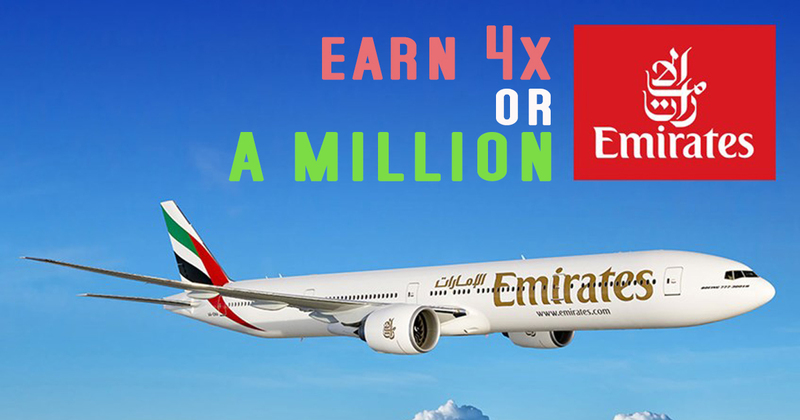 More details including information on how to register for the offer is available on the Emirates Skywards website. Members of the Emirates Skywards loyalty programme can also donate AED 20 (approximately SGD 7.40) for a good cause and stand a chance to win a million Skywards Miles. The ‘Thanks a Million’ campaign is in its 18th year and proceeds raised through the initiative will be donated to the Emirates Airline Foundation. The winners of the lucky draw, one for 500,000 Skywards Miles and another for one million Skywards Miles will be announced at the Dubai World Cup event taking place on 30 March 2019 at the Meydan racecourse. To donate and get listed in the Thanks a Million Draw, visit here. You can also make your donations at Dubai International airport and at Meydan Racecourse.